"Cupano delivers an ace card in 2008 with its Brunello that has seemingly defied all the difficulties of the vintage. The wine is elegant and complex, with pretty layers of dried fruit, leather, tobacco, spice and dark chocolate. The acidity frames the brightness of the fruit and the mouthfeel is long and plush. Drink after 2018." "(14.5% alcohol): Dark red. Highly perfumed aromas of griotte cherry, wild herbs and menthol; shows a distinctly medicinal aspect. Then supple, broad and full in the mouth, and quite dry in a classical way, with juicy acidity nicely framing the rich red fruit flavors. Finishes long and very savory, with hints of aromatic botanical herbs and ripe red cherries. This opulent wine just manages to remain this side of heavy; I'd enjoy it over the next ten years for maximum pleasure. And make sure you decant it an hour ahead." "Fruit-focused nose with red cherries, strawberries and vanilla. Very charming on the palate with sweet fruit and soft tannins. Quite a bit of new wood. Wonderful texture and harmony offering great drinking pleasure. Drink now." 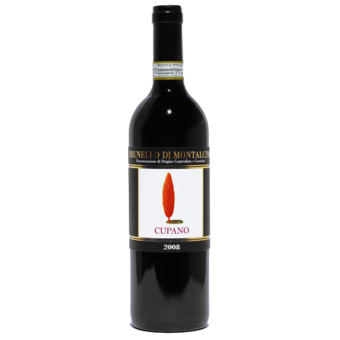 "Cupano's 2008 Brunello di Montalcino stands out for its textural richness, depth and persistence. A beautifully layered wine, the 2008 emerges from the glass with sweet dark cherries, tobacco, licorice, menthol and tar, all of which come alive in a sensual style that is very appealing. As always, Cupano's is one of the richest wines of the zone, but all the elements are very much in balance. The bouquet isn't as focused as it could be, but that is a relatively small critique for a wine that delivers so much personality and character." Dark red. Highly perfumed aromas of griotta cherry, wild herbs and menthol; shows a distinctly medicinal aspect. Then supple, broad and full in the mouth, and quite dry in a classical way, with juicy acidity nicely framing the rich red fruit flavors. Finishes long points and very savory, with hints of aromatic botanical herbs and ripe red cherries.